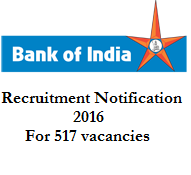 BOI – Bank of India has released recruitment Notification for the current year 2016.Bank of India has published recruitment notification for the posts of Officer Credit, Manager and Senior Manager Vacancies in the Bank of India Branches all over the India. Bank of India has inviting the applications from the eligible and interested Indian citizens who were ready to work in any location in any Bank of India branches all over India. Interested candidates may apply for those above mentioned posts through online mode only through banker’s official website. Interested candidates may apply before the closing date. B.Com with first class marks and MBA/ PGDBA/ PGDBM pass candidates are eligible for this post , final year students also eligible for Bank of India Officer Credit Post, and their Age limit will be, between 21 to 30 years as on 1st April 2016, working experience not required . B.com with 60% marks and MBA/ PGDBA/ PGDBM pass candidates are eligible for this post and CA , ICWA candidates also eligible for this posts, and their Age limit will be, between 28 to 35 years as on 1st April 2016, and the candidates should have 5 years experience in NBFC, Banks, Risk Managemnet/ Forex /Relationship Manger / Retail Banking or any Financial organizations. OR 2 Years Experience in Public Sector or private sector banks. B.com with 60% marks and MBA/ PGDBA/ PGDBM pass candidates are eligible for this post and CA , ICWA candidates also eligible for this posts, and their Age limit will be, between 30 to 38 years as on 1st April 2016, and the candidates should have 7 years experience in NBFC, Banks, Risk Management/ Forex /Relationship Manger / Retail Banking or any Financial organizations. OR 3 Years Experience in Public Sector or private sector banks. Online Application Starts: May 31st 2016. Closing Date for Online registration: June 14th 2016. BOI Exam Date will be announced soon on the official BOI website.for more updtaes click on the below link..